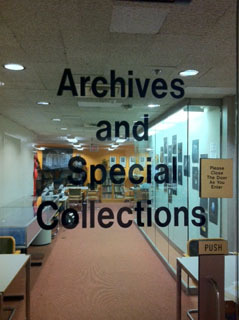 The Archives & Special Collections division at Hunter College was formally established in January 1966 under the direction of the archivist, Frederick W. Stewart. Originating as the Archives Centre, the repository collects books and unpublished materials of historical value including records, correspondence, papers and publications generated by the administration, academic departments, administrative offices, faculty, staff and student organizations since 1869. The division also holds graduate theses written by Hunter College graduate students in the Arts & Sciences and Humanities. Special Collections books and graduate theses are searchable in CUNY+. Please send us an email to arrange an appointment with the archivist, or complete an Archives Request Form. You can also come in and visit!